Rich Power Has been a fixture in the Long Island, NYC music scene for a number of years, has done a broad array of session and band work with a number of notable original and cover music acts primarily from the east coast. Know as one of the more tasteful and versatile players out there, Rich has great attitude along with a great skill set. Working with a wide range of performers from the original music act Tribes (where Rich first meet Gary Kiyan) to Blue Collar a main stay in the Long Island cover band scene. 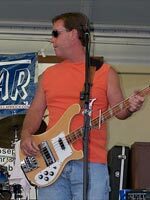 One of Richie’s strongest talents is his ability to listing to a song and gives to it creating tasty bass line that complement and enhance the music he is working on. Rich really adds fullness to the Dragon Boy’s with his lead and backup vocal abilities, perfectly complementing Gary’s songs and style of play. A rock solid player with a great ear and great vocal talents make Rich Power an asset to any music project he lends his talents to.